This is the value that will be used to start the numbering from. This is the increment that numbering will jump by from line to line. Programmers might use 10 or 100 for program listings, for example. This option allows the line number for each line to be used. When this option is used, the Start at and Step by options are disabled. Use this option to control whether or not blank lines will be numbered. Use this option for numbering which increases in value. Use this option for numbering which decreases in value. This option can be used to force leading zeros on the numbers. Use the field width property to control the width of the numbers that will be generated. Use '0' for automatic sizing. Use this edit box to specify the text to be placed at the left of the numbers. Use this edit box to specify the text to be placed at the right of the numbers. This option can be used for numbering which is left aligned. This option can be used for numbering which is right aligned. Use this option for numbering in the decimal system. Use this option for numbering in the hexadecimal system. The case of the alphabetic characters used can be controlled with the Lowercase and Uppercase options below. Use this option for numbering in the octal system. Use this option for numbering with Roman Numerals. The case of the alphabetic characters used can be controlled with the Lowercase and Uppercase options below. 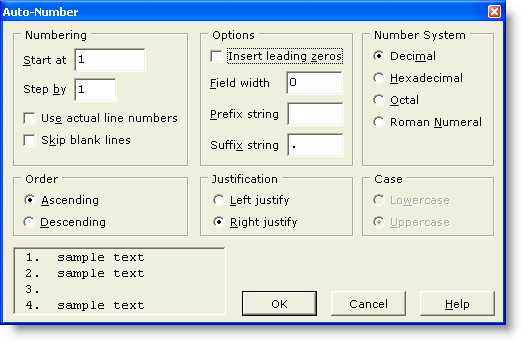 This option can be used to dictate that lowercase characters be used when Hexadecimal or Roman Numeral numbering is in use. This option can be used to dictate that uppercase characters be used when Hexadecimal or Roman Numeral numbering is in use.